The verdict is in and…. it’s a tie! Both forms of application are in their own winners because the outcome relies on the experience and skill of the makeup artist. As a makeup artist who works daily with both traditional and airbrush I have learned that though both apply differently, if applied properly there shouldn’t be a noticeable difference. That’s where getting to know your clients skin type and what will be best for them specifically. When I am working with a senior client who’s skin has seen the wrath of puberty, or a bride has a large patch of discoloration, I am going to trust my gut and use airbrush because of 1. coverage and 2. how the structure of the airbrush molecules will set on the texture of the clients skin. On the contrary of skin conditions, airbrush works very well on normal, even complexions because you don’t need apply as full a coverage. If my client has clear skin and a smooth complexion the airbrush will be lightly applied mainly focusing in the areas of correction and coverage. 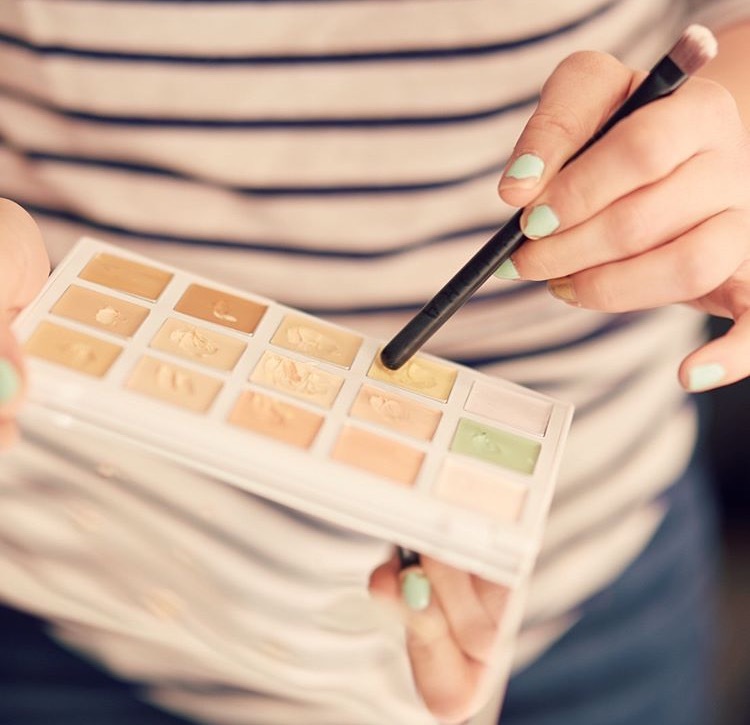 Whether you choose to set with powder or a setting spray is a personal choice of the artist, sometimes both are needed. Again it comes down to treating skin types individually. When I first began dabbling in airbrush I was not a big fan, but as time went on I upgraded my product line and was properly educated on how to apply airbrush makeup. I started to love the finish in provided to the clients skin. SKIN NERD MOMENT: The molecules of airbrush foundation are round, and when applied via the airbrush gun it has a more even application that sits on the skin, where as traditional makeup molecules are not round, they are jagged and require more technique to blend out into the skin providing an even finish. Don’t let a makeup artist give you an excuse like it doesn’t translate well on camera because that’s crap! Just like traditional foundation it’s in how you apply it. I work with several photographers that only advertise for airbrush makeup. The result of a photo is not only produced by makeup, but heavily in the shooting, lighting, and editing style of the photographer. Of course I will always be a fan of a traditional application because that’s where I feel most like an artist. I love being able to mix varied textured products and applying with my fingers, brushes, and beauty blenders! As I mentioned before the client with clear skin and smooth complexion, if she didn’t request airbrush I may suggest opting for a traditional foundation application because her skin requires less work to conceal and correct. That’s not saying there’s no need for shading, highlighting, blush, etc- that’s a different subject. Makeup is always changing so it’s exciting to see what’s next for application styles and product finishes. As a little girl, I would read through all of my mom’s beauty magazines, studying the how to’s before I could even wear makeup. Now are the days of Instagram and YouTube tutorials which are a great way of learning new techniques. I am a HUGE fan of RuPaul’s Drag Race, one of my favorite parts of the show is watching the makeup applications. To see them transform into a gorgeous work of art is so inspiring and the placement and effort that go into the looks are most commendable. The moral of the story: To each their own. Some artists just work with traditional foundation, others just airbrush. It really comes down to preference. It’s just as important for an artist to be upfront and honest about where they are comfortable. There is no right or wrong, as long as the client is happy with the outcome!